Hey Everyone. Today I’m going to be talking about the steps I took to clear debt and raise my credit score. I do it a little bit differently because I do use Universal Law and LOA/Mindset around this topic. The reason for that is because everything is energy. Including money, debt, our emotions, and us! It’s important to nurture your relationship with money and debt. The more in touch you are with your money, the easier it flows in. When you avoid debt and have fears around logging into your bank account-this was me circa 2014. Your subconscious attached fearful energy onto money. It doesn’t understand the details, it has no idea WHY you feel fear. It only understands fear in a primal way, as in this thing is causing danger to you. So, your subconscious does anything it can to resolve/protect you. All it connects is money is causing this danger. So, first I’m going to get into the basics/practical advice. Review all credit reports from the three bureau’s on www.annualcreditreport.com. You’re entitled to view all three for free once a year. Sign up for CreditKarma.com as well as experian. Get these as apps so you can check them often. This helps you keep track of your score and whether any fraudulent activity has been going on your report. I’ll admit, I NEVER did this before. I just avoided it, but believe me. Once you have to pay attention to it everyday, it becomes easier to work on rather than pushing everything aside and forgetting about it. Dispute anything on your report that doesn’t look right, you disagree with, even things you felt weren’t fair. Most of the time, the credit companies report back. Sometimes, you get lucky and get stuff taken off. Start paying all current credit cards on time, no exceptions. Even if it is just the minimum balance. After two years of just paying on time, my credit score jumped way up. If you have absolutely no debt or credit or completely bad credit. Get either a secured credit card or a retail card(Sears, Home Depot, REI.) Discover and Capital One offer secured cards, you pay a deposit and it mainly shows you’re reliable and pay your bills on time. This is your IN, to better credit cards down the line. Only spend about $50-$100 at first and start chipping away at that with the minimum or double the minimum payments. Once you pay off the debt, rinse and repeat. Once your score jumps to fair/good. Apply for a better credit card. My first and my favorite card is my AMEX Blue Cash. Be selective of where you apply as you get a ding everytime you apply for anything. This is called a hard pull, which usually lasts about 1-2 years on your credit report. Once I was approved, I obviously didn’t want to go down the same path I did over 10 years ago. I only spent knowing that this wasn’t my money, I saw it like a friend letting me borrow money that I have to pay back immediately. Years went on and I wasn’t always responsible with my money, I had a lot of ups and downs. I was late on payments, would forget the due date, couldn’t afford to pay sometimes, etc. Well, 2.5 years ago, I dedicated myself to always paying on time. I went as far as getting the credit card minimum linked to my bank account. I was done being irresponsible. Once, I decided to make that a non-negotiable. My credit immedietely changed. I know what you’re all thinking “DUH Jody, you have to pay your credit card on time if you want them to report positively about you!” Yet, this is something we all have brushed off at some point and need reminders of. It’s so simple and small, but it makes the most difference. The second time, I applied for a tough credit card. Which was my AMEX and I was surprisingly approved! At this time I was VERY conscious of the LOA. I made sure to give this card a detailed purpose, I prayed, I aligned my energy, I put myself into a state of joy and I asked. I visualized the number I wanted, I felt the feelings of having said card. I do break the rules sometimes, but it is always strategically because my card has 1% back. My rule is to never let debt sit over a month and to pay it off immediately if I am going to charge it. I keep in mind this isn’t free money for me to spend. You’re able to have money on hand in an emergency- stress becomes easier to cope with. You can plan travel ahead of time and actually get points for going on vacation. You don’t have to worry about deposits a lot of hotels and rentals take out. We use our card to get into the vibration of wealth by adding small upgrades that we would otherwise have to penny-pinch on. SO FUN! Rent that fun car, upgrade your hotel, etc. Decide exactly what you want, get really detailed. Price, feel, everything! Go into it open-minded and unattached to the outcome. Feel the feelings of having what you want. Visualize it before going to bed every night. Tip: I will hug my animals and get in a happy state, then imagine the feelings of getting exactly what I want.This helps me so much! Try to live as if you already have everything you want. Stay grateful for the things you currently have and pretend you’re already living your dream life! Stay in alignment as much as possible. We’re all human, we have bad days. Just don’t let those bad days become bad weeks, months, and years. Try to do things that make you feel happy, create boundaries and get rid of things that make you unhappy. Life is meant to be enjoyed right? Last, did you enjoy this post? 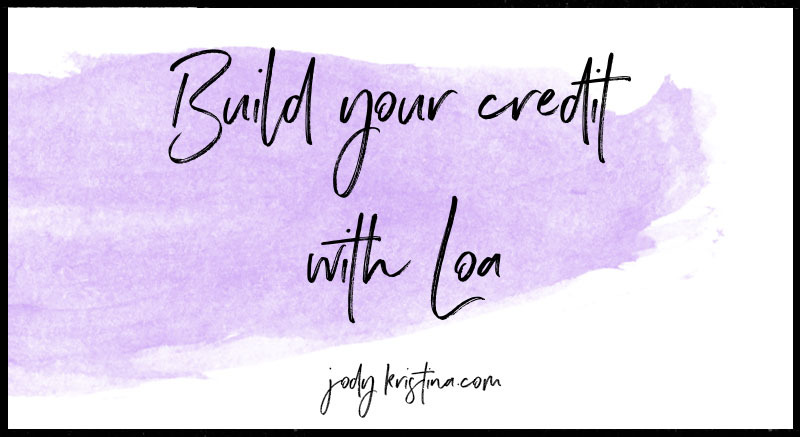 Do you have any tips about LOA and building credit? Hop into my co-create and slay group and let’s chat it up! I do live videos once every 1-2 weeks. We would love to have you.